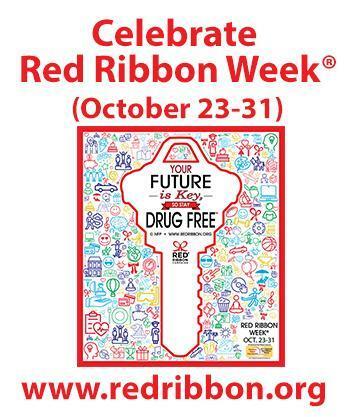 Beginning October 23rd is Red Ribbon Week…...this is a week for people to unite and take a visible stand against drugs and to make a commitment to live a positive and healthy lifestyle…..the National theme this year is…..Your Future is KEY, so stay DRUG FREE! Red Ribbon Week was established as a national awareness campaign in 1988 to honor a Drug Enforcement Agent Enrique Camarena who was killed in the line of duty. We will not only be learning facts and showing our commitment to a drug free life, but we will also be having fun with contests and prizes. .....wear red to show you make healthy choices!